IMPORTANT NOTE: Mill may be motorized, but doing so may cause excess wear on grinding surfaces and shaft. See owner's manual for more information. Wear and tear from motorizing your mill is not covered by the warranty. 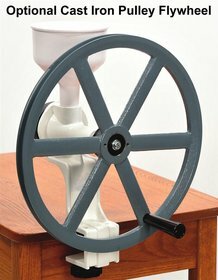 Our Grain Mill with Flywheel is OUT OF STOCK, but we have ordered more! You are still able to purchase it now and we will ship it to you as soon as it arrives. Questions? Please call 1-800-438-5346 or email us at info@Lehmans.com. Grinds any grain, nut, seed, or bean - Long-lasting, cast iron burrs can grind just about anything. Grinds finer than similar hand mills - Machined cast iron burrs grind all dry grains plus oily materials like soybeans, peanuts (peanut butter), coffee beans, sesame seeds (tahini) and some spices and small herbs. Easy to adjust - Adjusts from powder-fine to coarse with a turn of a knob. Durable - Bronze bearing hardened stainless steel shaft, double-ribbed handle and dent-proof plastic hopper. Optional flywheel - Purchase the grain mill with the flywheel for smoother turning and less effort. Flywheel 16"OD, 10-1/2 lb. Note: We call this mill our best because price is a factor for most people. 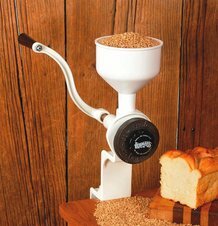 If price is not a major factor for you, check out our Diamant grain mill. It is the finest mill we've seen anywhere in the world! It turns much easier and more smoothly, grinds faster and is more durable. We love, love, love this mill! We purchased it from friends who were moving and had motorized a larger one. We use it most often to grind corn and wheat. Yes, it takes some practice to figure out how to adjust the grinding. Yes, it takes some time and effort to grind whatever you put in it. But, like another reviewer wrote, think about what you want this for and the time/effort you are willing to put in. We really enjoy having fresh ingredients in our foods, and we think it's good to keep away from the extra ingredients that commercial products use when possible. And not having to use electricity is actually a bonus for us as well. You need a mill that gets the job done, and this is it! I came to the Lehmans site to browse, but had to put in my 2 cent Stake! Also, I'm wondering if I will be able to get grinding stones should we ever need to replace ours. LOVE stone ground! This mill works great, though you have to fuss a bit to figure out the tension on the stones; grind multiple times to get really nice texture fine grind. The reason I gave a 3-star review is because I just can't figure out how to set the mill and/or what bowl to use so that it catches all of the grain. More on the counter and the floor than in the bowl! A big mess to clean up. Small batches would be OK, but if you want to bake something like a bread recipe that requires pounds of flour, you'll need to grind in advance or plan ahead so you have enough time AND energy. I have been using one of these for a while now and have the following experience: 1) It is surprisingly hard to turn, at least without the flywheel, and I am a strong manual worker/carpenter, so that is saying something. 2) It is slow. If you have all morning to make pancakes, or only need a cup of flour for a muffin, it will be quick enough, but if you want to make all your own bread, tortilla, pancake, etc flour with this, you are gonna need to budget some time into your schedule. On the upside though, you won't need to do any upper body workouts anymore... 3)Construction wise, the paint is pitted and I would love to know what is in it as it is peeling off from inside the grinding chamber on mine and I like to know what I am adding into my diet. I am considering buying the flywheel to see if that improves things, I sure hope it will, 20 min to grind a cup of rye is below my personal standards, that means 40 min before I can even get the first cake on the griddle. As an avid hand tool user, I feel that Lehmans needs to go back to the drawing board with this one, and make quality a bit more of a concern, even if it means raising the price a little, frankly I find this a little embarrassing for an American made product. So to sum up, I think this is great for anyone who just wants to occasionally make some fresh flour, on a sunday for example, but for anyone who wants to have all their flour fresh and all their bread fresh, look elsewhere (tempting price, but don't buy twice). A few things about this wonderful mill. Get the fly wheel, it will save your arms. Make sure you understand why you want this and what you want it to do. You are grinding wheat, and it is HARD work. My husband is very good with tools and put a non-slip pad on the bottom so I don't have to bolt it down. You will want to bolt it down if you do not do this. Motorization VOIDS your warranty. If this is a concern, this is not for you. It took us (my daughter and husband helped me) 1 hour and 1/2 to grind enough flour for 2 loaves of bread. This is not an issue for us, we like the process and the product. I just opened my mill to find the hole in the arm not big enough for the bolt on the handle. So annoying! I purchased this grain mill about 10 years ago, I used it a little back then, and then we moved and I stored it for several years. I pulled it out of storage about 8 months ago. It still works great. I just purchased replacement burrs for the mill. That is what I am reviewing. The replacement burrs are wonderful. I like them better than the original ones that came with the mill. Great product. Thank you. Our first try with the Best Grain Mill was a wonderful success! We ground buckwheat groats and had the buckwheat pancakes on the stove within 20 minutes. So easy to use, easy to clean and solid enough to be worth the price. An excellent product!! I bought this mill last winter, around January. I was thrilled to get it but upon inspecting the mill I noticed the whole outer coating was pitted like the sprayer was sputtering at the factory and left hundreds of air holes that popped. While it doesn't effect the function it concerned me that there will be build up over time that will fill those holes and I won't be able to clean it out. I wrote customer service but the only response was that I could return it, however I would then be out a second shipping charge. It wasn't worth it because shipping isn't cheap so I kept it. I read the directions and followed them for preparing the mill for use. The whole family gathered around and we milled our first batch of flour using white wheat. It took far longer than I expected and I had to keep readjusting the knob for the grinding burrs every turn or two. The directions said it would need to be done every 3 turns, which if I had known that before purchasing it I would not have bought it. I had read everything I could about this mill and even watched the video online about it before purchasing as I wanted to make the wisest, most informed decision with my money. I took a year too decide which mill would be the best purchase and decided on this one. The grain had to be ground once on coarse then all over again on a finer setting in order to get flour decent enough for making pancakes. While the pancakes were very tasty and the flour delicious we still had hard chunks of cracked wheat in it that caught a tooth unexpectedly even after two grindings. I was afraid someone was going to break a tooth. It took me 20-25 min. to grind approx. 2 c. of flour to a usable state. I was very disappointed after having waited for so long and being so careful in making the decision. I will use this mill because its the only one I have but will be purchasing a different one in the future. The old adage 'you get what you pay for' holds true with this mill. I wanted a good, efficient non-electric hand mill and have decided it will be worth waiting for a Diamant, which I've read wonderful first hand reviews on. 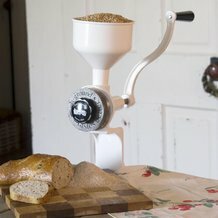 If you are on a low budget this mill will suffice just know that you will have to regrind every batch of flour and tighten the burrs every two times you turn the handle or your not going to get anything but cracked wheat. Oh, and while the set back feature of the mill does allow you to place a bowl underneath you need a very wide mouthed bowl or the flour sprays all over coming out of the burrs. I'd say the bowl I have to use to catch it is 10-12 inches in diameter and I still have to wipe up flour from the counter. And what the previous poster wrote about if its not bolted down it just wiggles back and forth is true. You can't tighten the clamp tight enough to keep it still. Its an okay mill if its all you have but I wish I'd not have wasted my money and had waited longer til I could afford the Diamant. Arrived two weeks ago, used it three times. We ground different grains, all of different coarseness. The smoothness and consistence of the grind was perfect. The ease in cleaning is good. Overall simplicity and finish of this item is very good. I have been trying to figure out how to operate this thing for months. I've given up at times and then gone back again. The handle is very difficult to turn to get a fine enough grain to make bread. I too stripped the handle bolt out and am now unsure if I'll be able to use it anymore. I wish I had gotten an electric mill.Additionally, without bolting the mill down it wiggles around and has marred my table. We weren't very impressed with this little mill for grinding flour. Would be ok for cornmeal. We've been familiar with grain grinding for years so we bought this one since it was advertized to be the best for a good price and adjust from powder fine to course with the turn of a knob. The finest flour we could get with golden wheat was gritty. Certainly not powder fine. Then the handle bolt stripped out. It was much too short for the job. Not enough threads holding. If you want a little mill for cracking grain or making cornmeal, this one would be fine. Otherwise, forget it. I would suggest paying the money for the Diamant or similar mill for good fine grinding. I boiught this hand mill after attending a Country Living Seminar that taught living independent. My family spent time grinding the Hard Red Winter Wheat - so it was a family affair!! We made two large loaves of bread and had enough fresh flour for pancakes the next morning. NOTHING tastes as good as FRESH flour in food. We are looking forward to ordering different kinds of wheat to try in our cooking. Thanks for a great product - - this should last long enough for our grandchildren to use it!! We are really enjoying our new grain mill, made cracked wheat cereal the next morning, then whole wheat bread. We are looking forward to trying many recipes in our new cookbook, too. Caveat: This is based on first use. Grain mill arrived in perfect order. My wife and I cleaned the mill per the instructions and put it to use this morning to grind some Prairie Gold wheat for pancakes. The mill ground the wheat with ease. Adjusting the burrs to the desired coarseness is very easy. Wow! The best pancakes ever! The mill was simple to use and very efficient. The grinding process was a great work out before breakfast. We are more than pleased with the quality and workmanship of the mill. Thank you Lehman's for a great product.